Our daughter Alie’s style in fashion is a mix of color, pattern, and comfort with stylish new and vintage pieces. 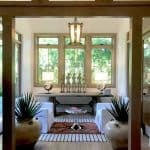 So, we wanted her apartment in Los Angeles to reflect that Bohemian-style. 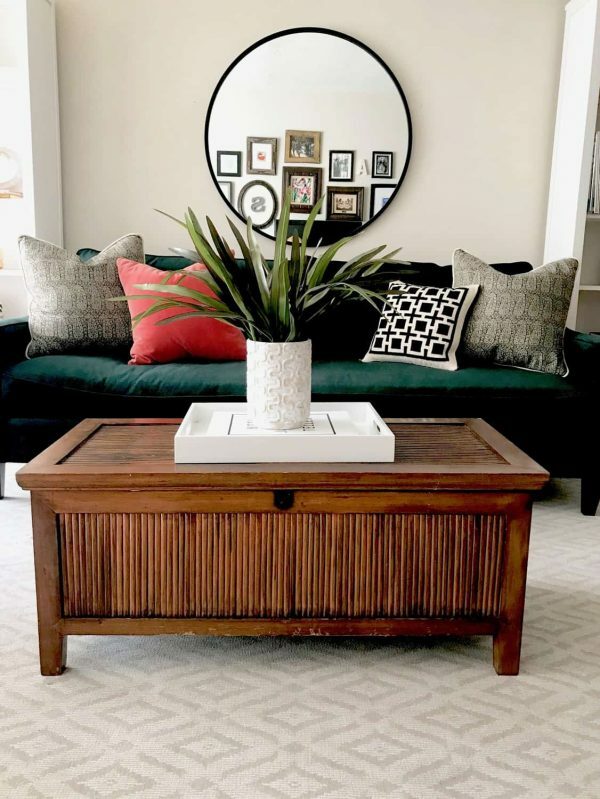 Modern Boho style is often characterized by rooms that encourage cozy conversation and have eclectic, vintage and new furnishings (that are budget-friendly, too) and greenery. 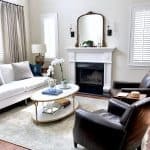 One of the most expensive pieces to buy when first furnishing an apartment is the sofa. Alie wanted something to last and I’ve had good luck with West Elm. 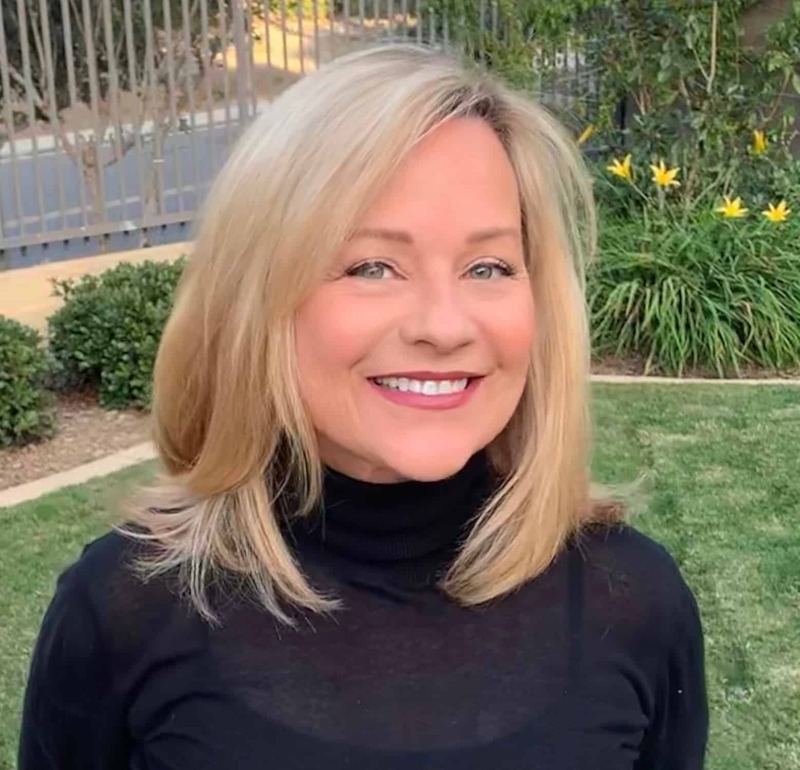 I encouraged her to buy a transitional style since she will have this for a while. This is the Paidge sofa in green velvet with the down-blend upgrade mixed with some of my pillows (love seeing them re-incarnated here). The white lacquer tray adds some modernity to the flea market chest as does the round mirror. The rug is a gift from Karastan from the Design Bloggers Tour that I was on in Highpoint, NC. We used two white IKEA bookcases to give the room some “architecture” along with two cute IKEA task lamps to serve and library sconces. Alie enjoys buying plants like the cacti. 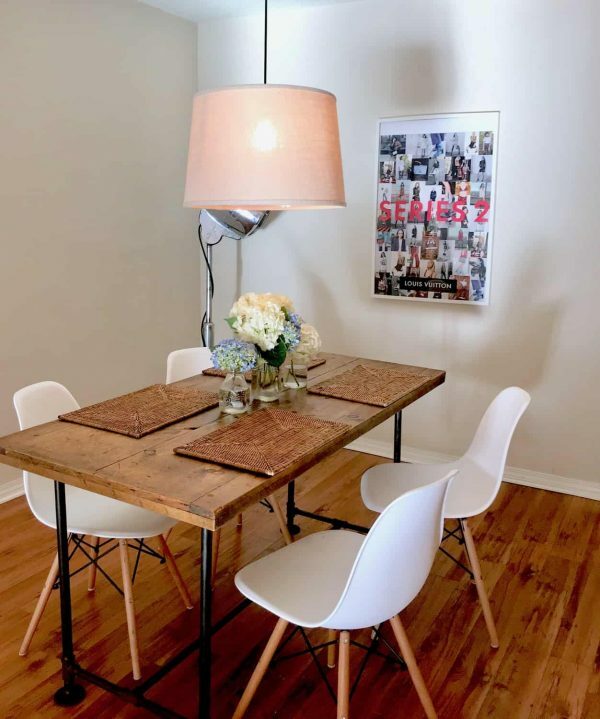 We put mid-century modern chairs from Overstock with an industrial table that we bought at the Brooklyn flea market (that could also be used as a desk someday). There are rattan placemats for texture. 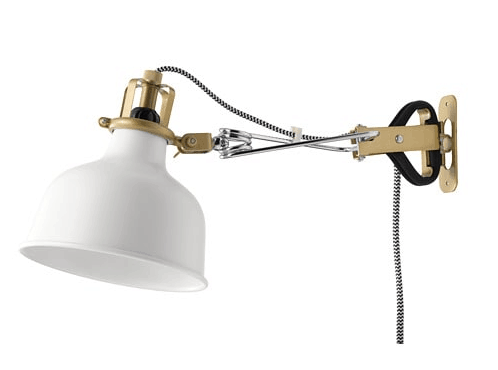 The pendant is an inexpensive drum shade from World Market with the pendant electrical kit. I bought the tea table when I was about Alie’s age. It’s serving as a bar cart. 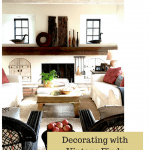 The painting and sconces are from flea markets. There’s a tripod lamp and Alie’s gallery wall and vintage globe collection (which she has added another to since the photo). Buy what speaks to you! It’s fun seeing Alie’s Modern Boho Style come to life! Now for an apartment that mixes modern and antiques on a whole other budget level! You have to check out Joni’s post: Perfection in A Highrise. Talk about awesome. 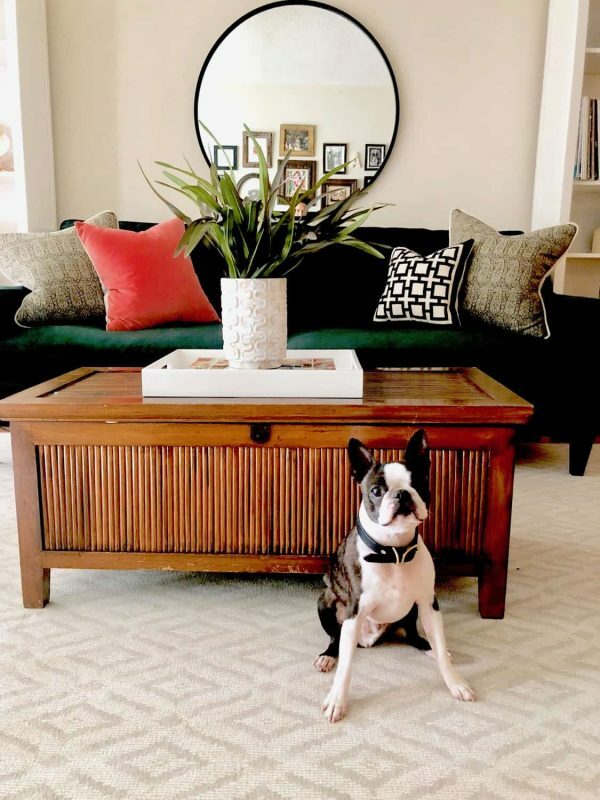 Chief likes his Modern Boho Style apartment as much as his other homes in California (he moves around!). But he’s coming back to SF next weekend 🙂 Are there chew marks on that chest, Chief? chic & cool, with Mom’s help! great fin ds Cindy, love the Ikea sconce set into the bookcase. It’s so welcoming. What a great place. 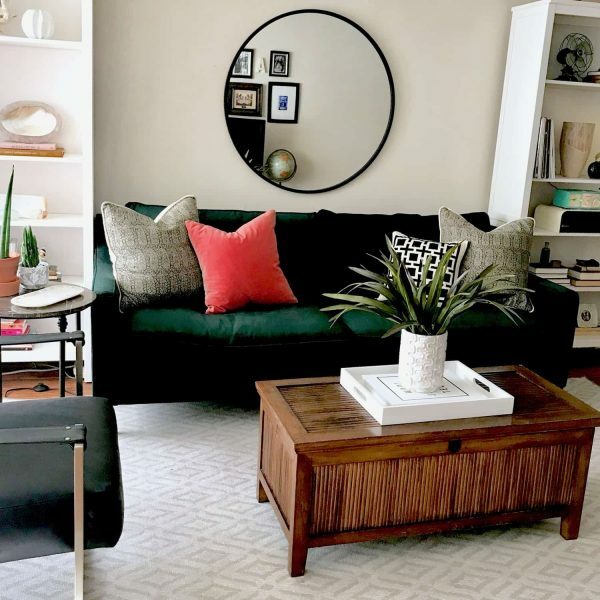 I like that green sofa–as a color, it’s so dark and natural that it doesn’t scream color–plus the way it’s nestled in a kind of alcove between the bookshelves. Well done! Beautiful apartment. I like the mix of modern and traditional elements. And the apartment with the book lined library is fabulous! 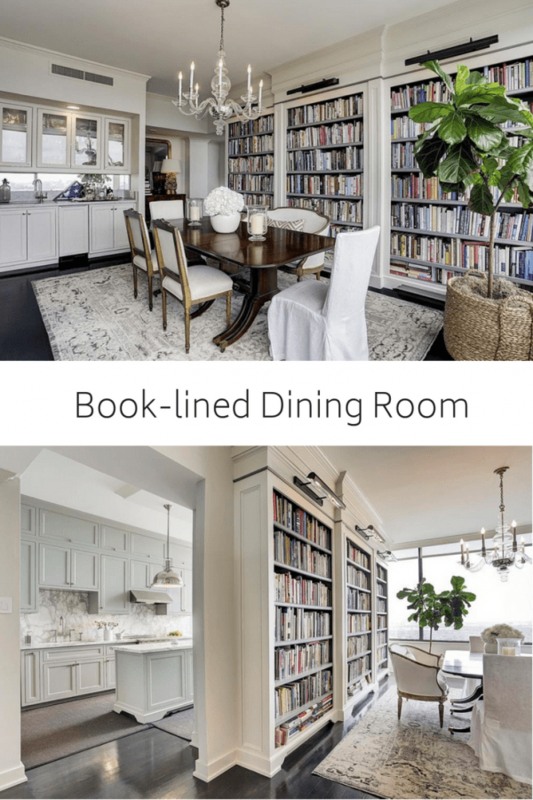 It reminds me of a friends apartment in Paris that makes double use of the dining room and uses it as a library as well. I love Alie’s apartment! 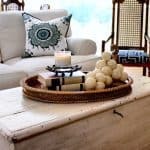 It has such a lovely eclectic vibe that seems so perfect for Alie’s amazing creative Bohemian style. 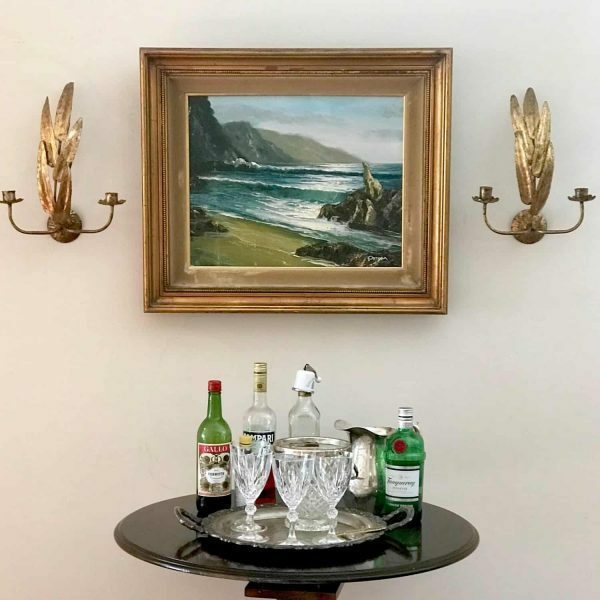 Mixing modern, antique, industrial and her new velvet sofa…and love her bar with the painting, sconces and the vintage glassware on an old silver tray. Perfect! Wow! Love that you can do this in a cost-effective way and make it so charming, fresh and full of personality! You and Alie are a good team. 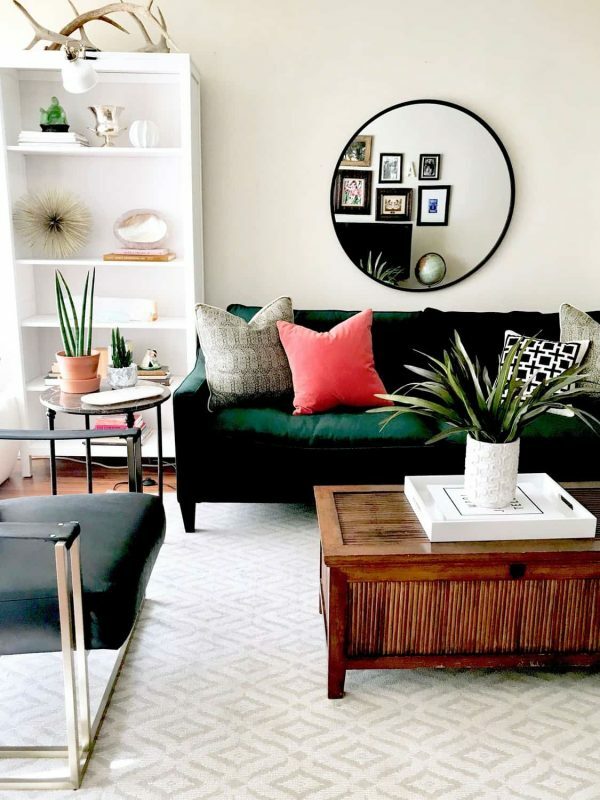 Allie’s apartment looks fantastic and just her style! That gallery wall is still so great. Lucky Allie to have such a talented mom! Always have loved Boho—even if I am not quite that exotic! Love the I love these things and they will love each other, too kind of style. Also like your reappearing pillows. I think Chief even looks younger in these digs! I love your daughter’s style. I like to hand down things to my kids, too if they want them. Its fun to see your old things get new life, isn’t it, Kim? Your daughter’s apartment looks great. You two make a great team. I love the style you’ve selected and it seems very cool for a young woman. Thanks, Karen! I still think she needs a new coffee table but these things take time! What a darling apartment. 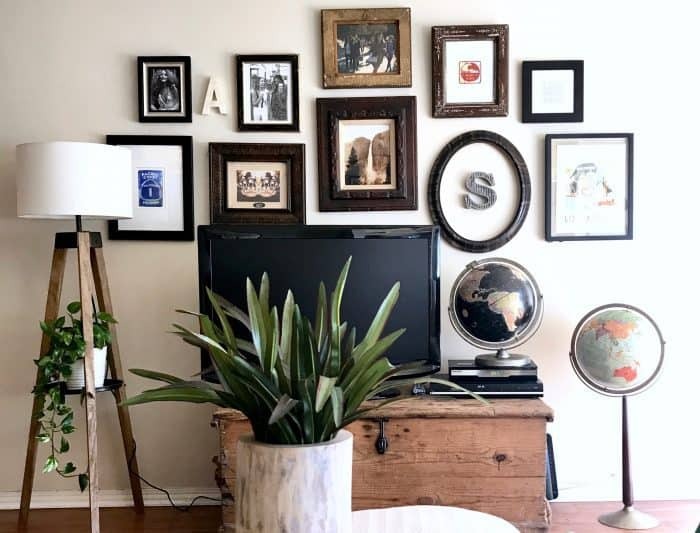 I LOVE the gallery wall – it hides the TV. Love it!!!! I LOVE your posts, Joni. Wow eleven years! I got started due to enjoying your posts so much! I think it’s been almost 9 for me. Keep it UP! !